the murmur of the stream. A poem of sorts written for Grace’s (everyday amazin‘) prompt on Real Toads to write something inspired by an Australian poet, Judith Wright. I was thinking of Wright’s poem “Woman to Man,” but honestly, I feel like this could be Woman to Woman or Man to Man, so did not want to use that title. 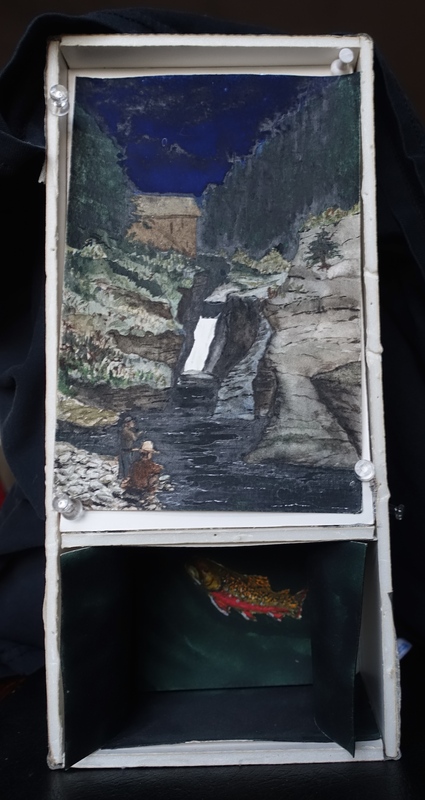 The pic is a photograph of a small watercolor piece made by my husband, Jason Martin, of a nearby stream with trout. This entry was posted on August 9, 2015 at 7:52 pm and is filed under poetry, Uncategorized. You can subscribe via RSS 2.0 feed to this post's comments. This piece is so sensual and at the same instant, timeless…I especially admire the way the reflections and impressions of the natural world meld into the human experience. Kudos, too, to Mr. Martin for the fine artwork. Thanks so much, Steve. My husband’s piece is really just in a shoe box and the painting is so beautiful. Hope all well and you are enjoying this beautiful weather. k.
The soft sounds of this are almost visual–indeed, they and the visual elements of the poem seem one–beautiful, peaceful and liquid, one that is cool as it beads–a masterpiece of echo and repetition, and I am so glad I read it tonight when life is so frazzling–the feel of laying it down to enter this world of sounds and spirit is restful and also provocative, full of life. Really a favorite for me, K–and I love your accompanying art–it suits the Impressionistic sense of blur and murmur the poem creates. Thanks so much. I felt good about it as it was rattling about my brain during the day–and the piece of my husband’s is older but one I really love. k.
ps -also sorry you are frazzled–hope Chinook on a faster mend. k.
Thank you so much, Grace, and thanks for these wonderfully inspiring posts about the different poets–I especially like that so many are not American or British–I really know so little about the bigger world of poetry–not much about the American and British one either–but you know–thanks! k.
This is exquisitely sensual, K. Love it. This is my favorite of yours, kiddo. Love all the repeated murmurings, and so tender the kneecaps cupped……..a lovely read! There is nothing more intimate than two people lying together in sleep. The image speaks of our need for security in our most vulnerable hours. I could really relate to your descriptions. Wow.. I love how you focus on the softness, almost inaudible building of sensuality.. knees is such an original point of focus.. and that use of rhymes.. an exquisite piece of poetry. This is a poem that should be whispered in that special person’s ear… Beautiful murmur. Love the visual/sounds in this piece. It is romantic. I agree with Magaly, it should be whispered into the ear of someone special.